I'm on a roll. Another chemo hat finished and washed and I'm planning on a ribbed hat for a boy for the next. Perhaps even one with a pompom. On such a roll that I had better be careful not to fall over. It's happened before. This is a child's beret. I'm sort of happy with it but was decidedly unhappy with the pattern and won't link. It wasn't originally written in English and it has the feel of having been translated in Babel fish or similar. It was very stilted. Now I'm experienced in doing hats, in knitting in the round. There were times I had to peer closely at the picture to work out what the instructions were really saying. It's a bit over the top too. Picot edge where hem is done later. No mention of knitting the hem which makes a much neater and stronger finish than sewing it. A twisted rib, lace and the pattern called for more decorations to be handknit and then sewn on. I think not. 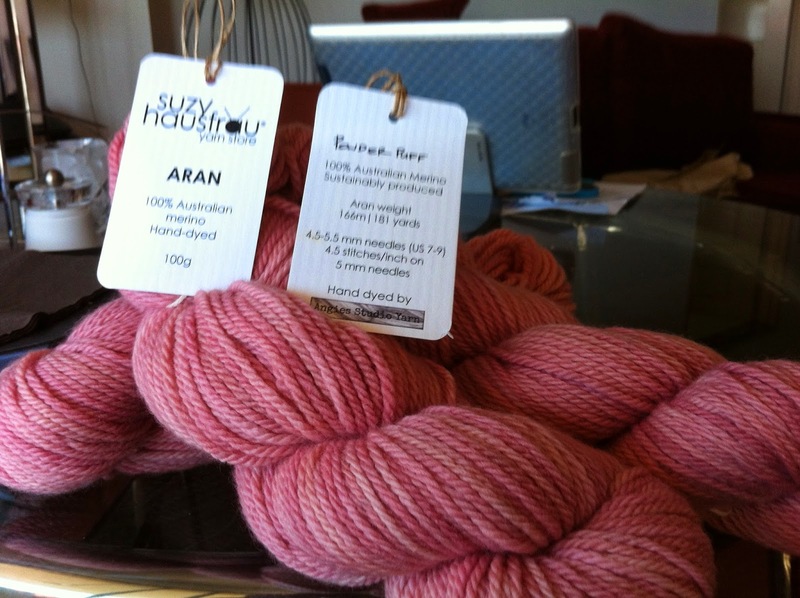 Renae at Suzy hausfrau is expanding her range to include her own label of sustainably produced merino. She introduced it at the Old Bus Depot Markets a few days ago. I didn't get there, wasn't even aware they were on, although I've now remedied that in my calendar. Roll on next year! She started with several colours in an Aran weight and will introduce more and hopefully other weights in her online store from the beginning of June. She had just a few skeins left over after the markets and I managed to get three in a colour called powder puff. I am not really a pink person but this is lovely. A soft dusky pink with some white through it. The wool itself is beautiful to use and it flows easily through my fingers. 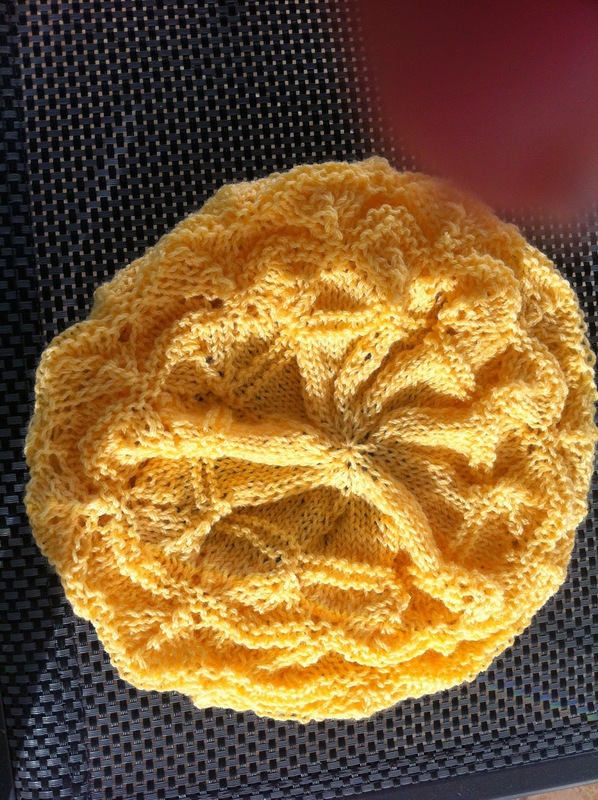 There are also pictures of the wool on her Facebook page with a link from the shop site. So what to make with this? I decided on the Acadian shawl/wrap from Ravelry. It's a free download from Ravelry. 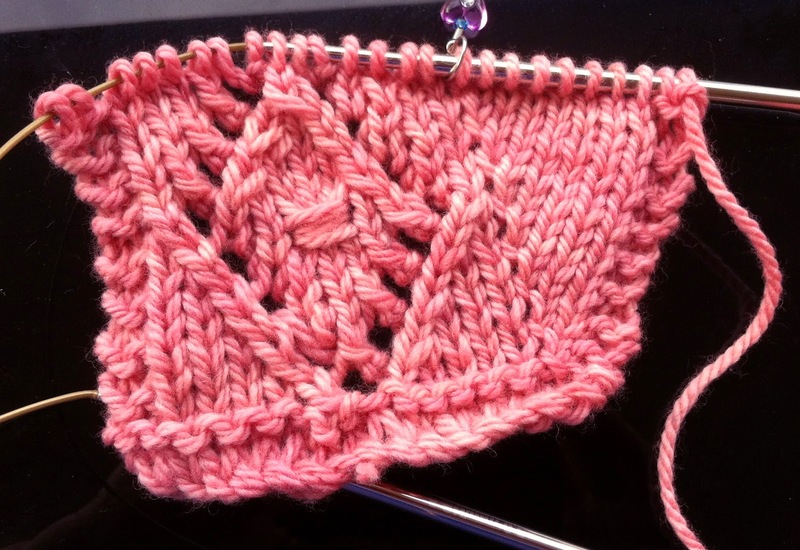 The stocking stitch section increases by a stitch on every knit row and the motif is an easy sixteen rows. There are seven motifs in the first section and I've now done four. Nine motifs make up the middle section and there are another seven motifs decreasing back to the original seventeen stitches. That's not a nupp in the middle. Instead, it's three stitches which are wrapped four times in a similar way to making a short row. It looks quite effective and is easy to do. Now for some lunch in the sun and unseasonal warmth outside. After that I will cast on another chemo hat, this time for a boy. I have plenty of Bendigo five and eight ply in my stash in a variety of colours. Enough to keep me going on these hats for a long time. That Powder Puff yarn looks very pretty.